What you're looking at is a graph of the "all time" hits for Writing About Writing. But here's the cool part. See how the line from September to October is straight. 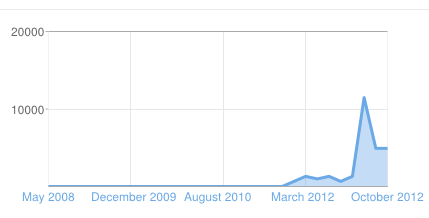 That means I have as many hits for October as I did in September. Why is that so cool? It's only the 16th. There's still half the month to go. THANK YOU SO MUCH FOR READING, EVERYBODY!! !